Leviton Industrial-grade locking toggle AC quiet switch in gray color, has voltage rating of 120/277-Volt AC and current rating of 20-Amps. This 1-Pole toggle AC quiet switch has fully enclosed switch mechanism in rugged thermoplastic housing for high-impact strength, tracking and arc resistance. Body of this toggle switch is shallow 3/4-Inch deep for making wiring easier. This toggle switch features heavy gauge copper alloy 1-Piece contact and toggle cam arm to make the toggle action smooth and firm for both fast-make as well as slow-break operation. It has large silver cadmium-oxide contacts to avoid sticking, welding and excessive pitting. Switch measures 4.06-Inch x 1.31-Inch x 1.03-Inch. Side-wired grounding terminal accepts wires of size 14 - 12-AWG, while the back-wired grounding terminal accepts wires of size 14 - 10-AWG. 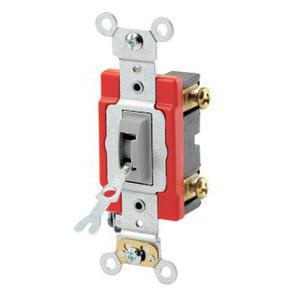 Locking toggle AC quiet switch has maximum load capacity of 1 hp at 120-Volts and 2 hp at 240-Volts. Toggle AC quiet switch featuring steel strap, supports box mounting. It withstands dielectric strength of 1500-Volts. It comes with large head triple-drive brass combination 8 - 32 terminal screws for quick wiring and installation. This self-grounding toggle AC quiet switch withstands temperature rating of -40 to 65 deg C. It has flammability rating of V-2 per UL94 to withstand harsh environment conditions. Toggle AC quiet switch is UL listed, CSA/ANSI C-73 certified, NEMA WD-1/WD-6 rated, RoHS compliant and meets NOM 057 standards.